What would it mean to live in cities designed to foster feelings of connectedness to the ocean? As coastal cities begin planning for climate change and rising sea levels, author Timothy Beatley sees opportunities for rethinking the relationship between urban development and the ocean. Modern society is more dependent upon ocean resources than people are commonly aware of—from oil and gas extraction to wind energy, to the vast amounts of fish harvested globally, to medicinal compounds derived from sea creatures, and more. In Blue Urbanism, Beatley argues that, given all we’ve gained from the sea, city policies, plans, and daily urban life should acknowledge and support a healthy ocean environment. The book explores issues ranging from urban design and land use, to resource extraction and renewable energy, to educating urbanites about the wonders of marine life. Beatley looks at how emerging practices like “community supported fisheries” and aquaponics can provide a sustainable alternative to industrial fishing practices. Other chapters delve into incentives for increasing use of wind and tidal energy as renewable options to oil and gas extraction that damages ocean life, and how the shipping industry is becoming more “green.” Additionally, urban citizens, he explains, have many opportunities to interact meaningfully with the ocean, from beach cleanups to helping scientists gather data. While no one city “has it all figured out,” Beatley finds evidence of a changing ethic in cities around the world: a marine biodiversity census in Singapore, decreasing support for shark-finning in Hong Kong, “water plazas” in Rotterdam, a new protected area along the rocky shore of Wellington, New Zealand, “bluebelt” planning in Staten Island, and more. Ultimately he explains we must create a culture of “ocean literacy” using a variety of approaches, from building design and art installations that draw inspiration from marine forms, to encouraging citizen volunteerism related to oceans, to city-sponsored research, and support for new laws that protect marine health. Equal parts inspiration and practical advice for urban planners, ocean activists, and policymakers, Blue Urbanism offers a comprehensive look at the challenges and great potential for urban areas to integrate ocean health into their policy and planning goals. "... Beatley expands his purview beyond the 'green urbanism' of Biophilic Cities to the vast oceans that make up 70 percent of the face of the Earth. While he still argues that cities must integrate green—really ecological design principles at all levels—into dense urban environments, he cautions that cities can’t ignore oceans and marine environments." "heartening, a nice dose of optimism in a field (conservation biology) that often focuses on the negative. ... Overall, this is a fun, engaging book. Anyone interested or passionate about urban sustainability or about the health of the oceans should check it out." "Beatley gives us a new perspective in viewing water masses (rivers, lakes, seas and oceans) as an extension of our cities and, in the end, an extension of ourselves." 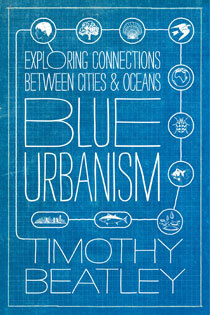 Editor's note: To celebrate the official publication today of Blue Urbanism: Exploring Connections Between Cities and Oceans, we thought we'd share Tim Beatley's reflection on why the topic is so important. Cross-posted from Biophilic Cities with permission. While we are increasingly the planet of cities, we must not forget that we live and share space on the blue planet. We rarely put these two realms (or words) together, but we must begin to. By some estimates, two-thirds of our global population lies within 400 kilometers of a shoreline. As oceanographer and National Geographic Explorer, Sylvia Earle, wrote in her important book, The World is Blue, “Everyone, everywhere is inextricably connected to and utterly dependent upon the existence of the sea.” There are dangers associated with rising sea levels, of course, presenting a need to grow and plan cities in ways that better respect these increasingly dynamic edges. But we are drawn to water, to the sights, sounds, smells of marine environments, and there is a deep biophilic impulse and need at work here that visiting the seashore starts to satisfy. There is at once calmness and intensity and a mysterious world just beyond our reach. Research by Michael DePledge and his team at Exeter University demonstrates what we have always known, which is that we enjoy visual and physical proximity to water and that these settings deliver immense emotional and therapeutic benefit. Our human fate here on the blue planet is, not surprisingly, intimately tied to ocean health. And oceans are suffering in many ways—acidification and other impacts of global warming, industrial over-harvesting of fish and seafood, the accumulation of the immense detritus and pollution of modern life, from plastics to chemicals to crude oil. Is there a chance that growing cities can muster their wealth, creativity and political influence to come to the aid of oceans? The vision of Blue Urbanism suggests yes! From the redesign of coastal edges and the promise of blue urban design, to new approaches of promoting sustainable, local seafood, to a variety of ways to build new emotional connections to the sea, there is much that cities can do. At the heart of an urban-ocean agenda is the belief that cities, and the people who inhabit them, can and must exert the leadership needed to protect, conserve and care for the marine world. It is in our self-interest to do so, of course, but there is a broader ethical duty to the immense marine life found there and to all the life on the planet that depends on healthy oceans. How then, and in what ways, can cities be profoundly ocean-friendly? What does a deep blue urbanism suggest about the ways in which we occupy space near oceans and the many different ways in which urban consumption and lifestyle impact the ocean world? Oceans, moreover, harbor immense amounts of biodiversity, and hold the promise of stoking our collective sense of wonder and enhancing in important ways the quality and meaning of our lives. Read the rest of the post.